Happy Feet is an immersive adventure game filled with song and dance that puts the player in the “tap shoes” of Mumble, a young penguin born into a nation of singing Emperor Penguins. Unfortunately, Mumble can’t sing a note...but he can tap dance something fierce! Mumble’s inability to find his “Heart-Song” means that he can never truly belong, or more importantly, win the affection of his beloved Gloria, one of the most sought-after penguins in the nation. Following the general storyline of the film, the player will be able to experience life from the point of view of Mumble; in exploration, music, dance and interaction with the friends and enemies of the penguin’s world. You will become Mumble from fluffy toddler to confident adult as you belly-slide, kick, break, swim and dash through the enormity of Antarctica. The playful and lively music soundtrack complements the exciting rhythm matching game play and two-player dance-off competitions. Mumble will leave the colony an outcast, but return a hero, using his unique toe-tapping talent to save the Emperor Nation! Tap Dance to distract enemies and woo Gloria! Face off against different opponents to unlock new areas and earn new dance moves. Playful and lively soundtrack of music in the memorable styles from the film including rock, disco and country allows for exciting rhythm matching game play. Dance encounters with memorable characters like Lovelace and Gloria while collecting songs to create a custom soundtrack. Belly-slide, kick, break, swim and dash through the enormity of Antarctica. With Mumble’s sleek and aerodynamic penguin form, navigate the sometimes perilous but beautiful tundra in water and on land. Multi-player Family Mode features two-player dance-off competitions, rhythm matching swimming challenges and belly-sledding action. Faithful to the film. Experience your favorite environments and characters from the film. NPCs include Memphis, Norma Jean, Lovelace, Adelie Amigos, Seymour, Noah the Elder, Albatross, Elephant Seal and Ramon. Also, discover the reason behind the shortage of fish! Complete 28 missions in 5 different locations to win the heart of Gloria. Explore, belly slide and dance through Emperorland, Adelieland, Land of the Elephant Seals, Forbidden Shore/Whaling Station and the Zoo. Character growth: Play as Mumble the adorable fluffy toddler, the molting teen, and the confident young adult with unique game play for each age. Pick up collectibles such as fish, snowflakes and trash to aid in your quest for a heart song. Collect songs for the jukebox, snowflakes to unlock characters, grace notes to correct your dance moves and turbo squid to boost your speed while belly sledding. The gameplay of Happy Feet is your traditional arcade game where the player must use a variety of penguin combinations such as belly-slide, kick, break and swim to interact with the gaming environment. Although Mumble goes on a variety of subquests, the player also has access to a very entertaining two-player dance-off that will have the younger generation of gamers yearning for more. The beauty of the gameplay of Happy Feet is that our hero starts off as a cute fluffy penguin and as you progress through the game, you eventually become an Emperor Penguin. 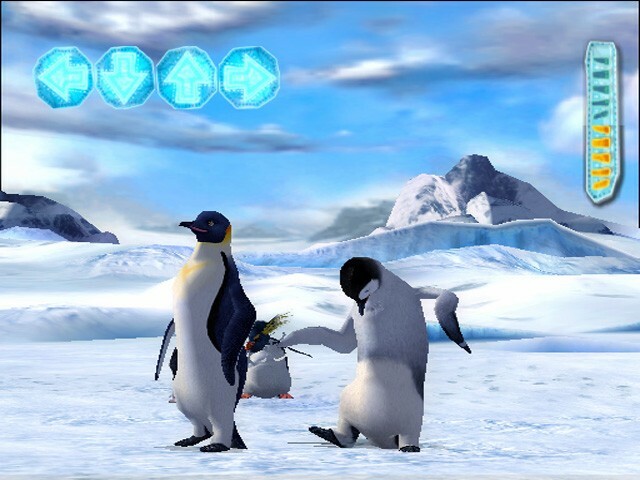 The control system of Happy Feet is rather straightforward and it uses the controller to its advantage with the analog sticks used to control this entertaining creature through the gaming environment. Combat is also quite straightforward and will not be too difficult for the inexperienced gamer. However for those older gamers, they may need to find their challenges elsewhere. Graphically, Happy Feet is quite impressive on the PlayStation 2 that uses a wide gamut of special effects that really make the player think that they are watching the movie of the same name. The characters, backgrounds and the lot have been professionally recreated into one entertaining and graphically impressive title that from it's colour scheme has been designed for the younger gamer and to impress! 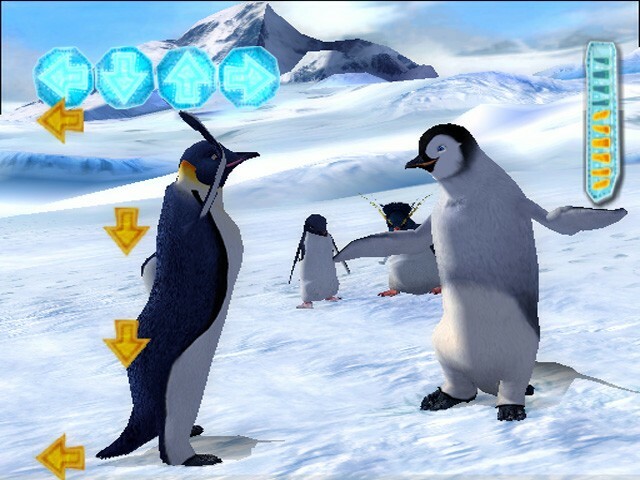 The sound effects in Happy Feet feature a variety of sound bites from the Hollywood blockbuster and the original musical score that is sure to have gamers of all ages dancing. The voice acting ranges from excellent to amusing as the actors try to give their own unique spin on the characters that they play. In conclusion, Happy Feet is an entertaining and simplistic arcade game that younger players will have hours upon hours of fun with some great replay value with the two-player games. Great graphics, a sturdy gaming engine and an immersive storyline, this might be a definite for the Christmas wish list!